Koh Kae has been a favorite snack in Thailand for many years. We have the original flavor in stock. Tom Yum flavor shown in picture is not available at this time. 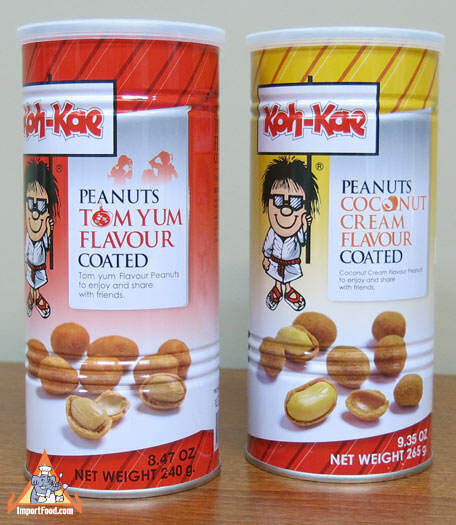 Thailand grows very high quality peanuts, and these are the very best packaged for export in a modern strong tin can with resealable plastic top. We are offering the large, strong can which is 6.5" tall with 3.5" diameter. Ingredients, Tom Yum: peanuts, wheat flour, glutinous rice flour, Corn flour, palm oil, tom yum flavor (yeast, capsicum, lemongrass, sugar, salt, shrimp, squid, cocoa, msg, disodium guanylate, disodium inosinate, tapioca starch, silicon dioxide, citric acid, palm oil, acetylated distarch phosphate), sugar, salt, rising agent sodium bicarbonate, sweetener sweetener (acesulfame potassium). Product of Thailand. Ingredients, Original Coconut Flavor: peanuts, wheat flour, sugar, coconut oil, iodized salt, coconut cream, sweetened condensed creamer, rising agent ammonium bicarbonate, sweetener (acesulfame potassium). Product of Thailand.